Knowledge organization has a major role to play in effective and efficient storage and dissemination of information. Traditionally, enumerated subject heading lists, library classification systems, controlled vocabularies etc. were used to organize knowledge. However with the advent of information and communication technologies like Internet and world wide web, knowledge organization has acquired new significance as people are relying heavily on these technologies to store, transmit and disseminate information. In this digital age, when computers and other such gadgets are taking the role of information service providers, replacing human interfaces designing efficient and effective knowledge organization systems and tools has become paramount in order to enable machines to understand, interpret and satisfy the information requirements of people not only belonging to academic and scientific community but also belonging to various sections of the society. In addition to the traditional systems, new tools like ontologies, concept maps etc. are being developed to organize knowledge.In spite of all these efforts, developing effective Knowledge Organization systems and tools still remains as a distant goal to be achieved. Primary reason for persistency of the problem is knowledge organization systems and tools developed till date are based on the philosophical view which equates knowledge with facts and treats knowledge as independent of the subject i.e. human being. This paper attempts to discuss the limitations of such philosophical basis for developing knowledge organization systems and tools and suggests an alternative approach based on human needs as human needs are the fundamental driving force for man to seek knowledge. Knowledge organization has a major role to play in effective and efficient storage and dissemination of information. Traditionally, enumerated subject heading lists, library classification systems, taxonomies, controlled vocabularies and thesauri were used to organize knowledge. However with the advent of information and communication technologies like the Internet and world wide web, knowledge organization which was earlier considered to be more relevant only in places like libraries, archives and museums, which collect and organize different sources of information such as books, magazines, and artifacts etc. has acquired new significance as people are relying heavily on these technologies to store, transmit and disseminate information. In this digital age, when computers and other such gadgets are taking the role of information service providers, replacing human interfaces, designing efficient and effective knowledge organization systems and tools has become paramount in order to enable machines to understand, interpret and satisfy the information requirements of people not only belonging to the academic and scientific community but also belonging to various sections of the society including industries, businesses and even amateur and enthusiastic common man on the street whose information requirements are different from another. In addition to the traditional knowledge organization systems, new tools like ontologies, concept maps and topic maps etc. are continuously being developed to organize knowledge suiting to the information requirements of the modern society. In spite of all these efforts, developing effective KO systems and tools still remains as a distant goal to be achieved. “Knowledge" as a concept is still ambiguous and there is lot of debate over what constitutes knowledge. A peep into the developments that took place both in epistemology and knowledge organization systems over the centuries reveals how western philosophers since ancient to contemporary times while trying to define knowledge took many seemingly contradictory positions, and how it got reflected in knowledge organization systems which organize knowledge based on the theories of knowledge postulated by philosophers. In ancient Greece, Plato theorized that knowledge is merely an awareness of absolute, universal Ideas or Forms, existing independent of any subject trying to apprehend them. Later Aristotle, the student of Plato, while working on his teacher’s postulates emphasized on gathering such knowledge through logical and empirical methods and thus laid the foundations on what developed the modern day science. Following the Renaissance with the invention of instruments such as the microscope and telescope etc. the world gave rise to two distinct schools of thought namely empiricism and rationalism. Empiricism views knowledge as a product of sensory perception formed by the mapping of the external objects by human mind through sensory organs with the help of different observation instruments. According to these empiricists, though knowledge has no a priori existence, as described by Plato, it is still absolute, in the sense that any piece of proposed knowledge is supposed to either truly correspond to a part of external reality, or not. At the same time rationalists consider knowledge as a product of rational thinking. Later, Immanuel Kant developed a theory of knowledge with the objective of providing a solution that is a synthesis of empiricism and rationalism. According to Kant, knowledge results from the organization of perceptual data on the basis of inborn cognitive structures, which he calls “categories”. Categories include space, time, objects and causality. This epistemology does accept the subjectivity of basic concepts, like space and time, and the impossibility to reach purely objective representations of things-in-themselves. Yet the a priori categories are still static or given. In the next stage of epistemology development which is called as pragmatic, knowledge consists of models that attempt to represent the environment in such a way as to maximally simplify problem-solving. It is assumed that no model can ever hope to capture all relevant information. Therefore, several models exist simultaneously, even if they appear to be contradictory. A model will be chosen depending on the problem to be solved. There is an implicit assumption that models are built from parts of other models and empirical data on the basis of trial and error complemented with some heuristics or intuition. By this time advanced information and communication technologies have become the major medium for information storage, transmission and dissemination resulting in information explosion and information overload. It has grown beyond human capabilities to analyze and make sense of such large chunks of information. So, in order to enable computers to process that information, computer scientists have started developing ontologies, to designate the building blocks of concepts, out of which models of the world are made whereby an agent such as a computer program will be in a position to process information, as represented by those models. As it is not possible to develop a computer program which can perceive the whole world, as Michael Lesk speculates that while a single KOS would be advantageous, it is unlikely that such a system will ever be developed. Culture may constrain the knowledge classification scheme so that what is meaningful to one culture is not necessarily meaningful to another.3 Therefore, we live in a world of multiple, variant ways to organize knowledge. So, there will be several models representing several building blocks of knowledge depending upon the situation and depending on the point of view in which a particular chunk of information has to be processed. Whatever may be the focus of all these theories of knowledge, all those theories are trying to define “WHAT” Knowledge is. It is justified as far as epistemology is concerned, but when it comes to devising a system to organize knowledge, apart from the “what” aspect of Knowledge, the “WHY” and “HOW” aspects of knowledge i.e. Why knowledge is sought and how the human mind organizes the knowledge so acquired are also very vital because after all the sole purpose of any knowledge organization system is to provide information about the objects (those objects could be about tangible entities or intangible and abstract ideas, beliefs etc.) to subjects i.e. human beings. In other words, the design and development of any knowledge organization system has to be in accordance and in synchrony with the methods and processes adopted by human mind to organize knowledge within. 3. Why is Knowledge Sought? To live and grow are the fundamental instincts of all living beings. Other living forms are able to survive and grow because of the biological instincts. But in human beings their aspiration is the key for their survival and growth. Man seeks knowledge to fulfill his aspiration – to attain perfection, freedom and happiness.4 To achieve happiness, man aims to fulfill his fundamental needs including basic needs such as food, shelter, health etc. cognitive needs such as curiosity to know and understand mysteries of the nature, expressing through various forms of arts and culture, sharing his knowledge with other members of the society etc. ; and social and emotional needs such as religion, customs rituals, and institutionalizing all these activities etc. All these fundamental needs are interdependent and impact and get impacted by each other. Professor György Márkus† while systematizing the ideas of Karl Marx on human needs describes that “humans are different from other animals because their vital activity, work, is mediated to the satisfaction of needs, which makes a human being a universal natural being capable to turn the whole nature into the subject of his/her needs and his/her activity, and develops his/her needs and abilities (essential human forces) and develops himself/herself, a historical-universal being. Work generates the breach of the animal subject-object fusion, thus generating the possibility of human conscience and self-conscience, which tend to universality (the universal conscious being). A human being’s conditions as a social being are given by work, but not only by work as it is not possible to live as a human being without a relationship with others: work is social because human beings work for each other with means and abilities produced by prior generations. Human beings are also free entities able to accomplish, during their lifetime, the objective possibilities generated by social evolution, on the basis of their conscious decisions. Freedom should be understood both in a negative (freedom to decide and to establish relationships) and a positive sense (dominion over natural forces and development of human creativity, of the essential human forces. To sum up, the essential interrelated traits of human beings are: a) work is their vital activity; b) human beings are conscious beings; c) human beings are social beings; d) human beings tend to universality, which manifests in the three previous traits and make human beings natural-historical-universal, social-universal and universal conscious entities, and e) human beings are free”. In other words human beings perceive “Nature” as a source to fulfill their needs of self and of the society. Similarly McGarry in his book titled “The Changing Context of Information” explains the reasons for the growth of disciplines.5 He says, “No matter how theoretical a discipline may be its origins lie in a social need of some kind and it also satisfies some of the social needs of its members. Not least among these needs are intellectual curiosity and self esteem”. Peter Drucker the management guru of the 20th century also expresses the same view when he says, “Knowledge like electricity or money is a form of energy that exists only when doing work.”6 Thus, man through a continuous process of learning seeks knowledge to sustain and improve the quality of life as an individual and of the society as a whole not only for the present but for the future too. 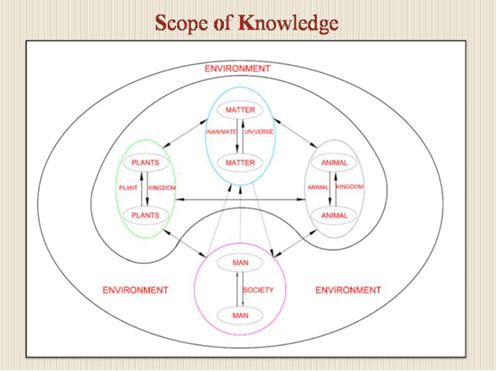 Thus, at the physical level, knowledge has two purposes; firstly to enable humans to use the knowledge to solve their individual, social and societal needs, secondly to pass on the knowledge accumulated while solving the human needs to next generations, through education and also as a knowledge base. At a level higher than physical, the purpose of knowledge is to enable human being to know himself. The interactions and dynamic relationships that humans establish with their environments (including both natural that is physical as well as social environments). The interactions and dynamic relationships that operate between various components of natural/physical and social environments. The results and outcomes of those interactions. Development of these mental reference models are conditioned by various social, economic, political, cultural situations in which human beings perform; and also the kind of functional roles performed by human beings in the society within the geographical spaces and time frames. 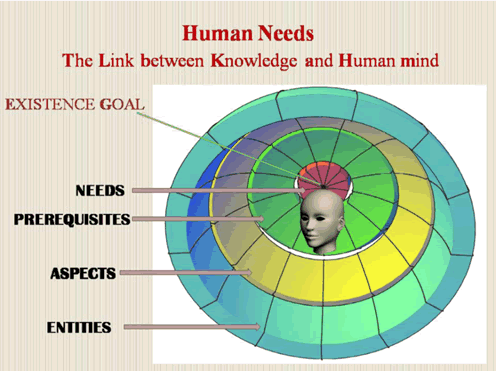 In other words, “human need” is the fundamental link between human mind and knowledge. Human mind perceives everything in this universe including man himself as a means to fulfill his needs and the knowledge so created when shared with others becomes the ‘universe of knowledge’. The knowledge so formed when shared among other members of the society or community, becomes external knowledge. "Human mind tries to know about things of the external world by dividing them into small parts and viewing each part as a whole in its own right." Of the many semantic relationships identified by psychologists, linguists and computer scientists, semantic relationships such as genus-species, part-whole, instance of, paradigmatic, causal relationships are the ones most often used for organizing knowledge both by conventional KO tools such as taxonomies, thesauri and classification systems as well as advanced KO tools like semantic networks.10, 11 All of them are developed based on “is a” relationship to represent super ordinate and subordinate, cause and effect relationships. These semantic relationships form the core in understanding what knowledge is. However, human mind, apart from “is a” relationship, organizes knowledge based on another important relationship namely “required for” because, the fundamental purpose of seeking knowledge is to fulfill the needs, i.e. all phenomena are fundamentally perceived, evaluated based on their capacity to fulfill various human needs. Human mind due to its unique capabilities simultaneously organizes knowledge in more than one way. During the process of learning and understanding these associations are organized hierarchically, while applying that knowledge to fulfill the needs the same phenomena are associated with each other as networks based on “required for” relationship. For example both cotton plant and lady finger (okra) plant belong to the family Malvaceae. While understanding about these plants, it organizes them together hierarchically based on “is a” relationships. However while evaluating their usability, mind associates cotton plant for fulfilling the clothing needs, whereas okra (lady finger) is associated with food based on “required for” relationship. suitability to both electronic as well as conventional environments. Human needs are multi-dimensional and multifaceted because they originate, and operate within the social and natural environments in which human being lives and as a response to the dynamic interactions and relationships human being develops with its environments. Thus, whatever may be the level and type of the human need, it will always influence and be influenced by social, economic, environmental, political, scientific, technological situations and factors of the society at physical level and judged by beliefs, values, opinions at higher level within the context of space and time. As a result the external knowledge created by man will also be multi-faceted and multidimensional. If we consider ‘human-needs’ as the basis for designing knowledge organization and information retrieval tools then the tools so developed will be able to represent and accommodate these intricate and complex relationships that operate in the society. Knowledge is organized at four levels. Fundamental needs are placed at level 0, followed by pre-requisites at level 1, Aspects at level 2 and entities at level 3. Since fulfillment of human needs is the prime motivator of knowledge, all the basic needs become the first level categories, which are called as the “Fundamental Categories”. The universe of knowledge is then placed under these categories depending upon the fundamental need they fulfill. Figure 2 gives a diagrammatic representation of the basic framework for organizing knowledge based on “human needs” approach. There will be certain pre-requisites to fulfill the human needs. All those components, which are essential to fulfill the needs, are placed under each fundamental category. For example, health is one of the fundamental categories in the new scheme. Diet, exercises, hygiene, diseases, prevention/curing systems, pharmaceuticals, pharmaceutical industry, knowledge about human body, infrastructure, psychology, management and administration of medical facilities, role of government/NGOs/ other organisations etc. are the “Essential Components” required to achieve the objective of Health. All phenomena that perform the function of the Essential Components are placed in this level. The categories and sub-categories are all designed based upon the fundamental needs. Therefore, it will be very easy to analyse the subject content of documents depending upon the fundamental need they fulfill and organise them at appropriate places in the scheme. As every human being is familiar with most of the basic needs, they can easily relate documents with the categories. It requires very little training. Social needs do not change with the changing times. What changes is the means adapted to fulfill these needs. For example, health is a basic need of man from times immemorial and it will remain so even in future. However, the means adopted by man to have good health have certainly changed with the changing times. Earlier man used to believe in superstitions and mysticism to cure his ailments. Today he uses more scientific means such as medicines and other such means to cure his diseases. So if we structure our knowledge based upon the fundamental needs, it can sustain itself through the changing times. The divisions and categories of the scheme are natural and developed based upon the human and societal needs, whatever be the growth of the knowledge, it just fits into the scheme. Due to the inherent principle of organising knowledge based upon the fundamental needs, the relationship between subjects and disciplines. For example pharmaceutical industry in conventional classification schemes would be located under industry in the main category of economics. Because of this separation, the relationship which exists between health and pharmaceutical industry either gets hidden or is totally lost. But under this new scheme pharmaceutical industry is placed under health because the fundamental need it fulfills is health. Pharmaceutical industry has come into existence because of health, not the other way around. Though it certainly contributes to national economy and revenue, the primary objective and purpose of the industry is to fulfill the health needs of people. "We can attempt to create comprehensive and universal knowledge organization systems if we follow the human needs approach." So far, the objective of creating comprehensive, universal systems of knowledge organization remained unfulfilled because every attempt of knowledge organization has followed subject-based approach. However, we can attempt to create comprehensive and universal knowledge organization systems if we follow the human needs approach, as Human needs are eternal and universal in nature and are same irrespective of national boundaries, economic status of nations, religions, beliefs and cultures followed by populations of the world. Hence if we consider ‘human-needs’ as the basis for designing knowledge organization and information retrieval tools then the tools so developed will be able to represent and accommodate these intricate and complex relationships that operate in the society. Such KO tools will provide comprehensive and stable framework to organize knowledge both in physical as well as in digital environments. Jayasree, A. (2008) Knowledge organization tools based on “human needs” for digital and Internet environment, SRELS Journal of Information Management, Vol.45(2), p.129-142. Jayasree, A. (2001) From “Subject” to “Need”: A shift in approach to classifying information on the Internet/web, Neelameghan, A. and Prasad, K.N.(eds. ), Proceedings of the National seminar on classification in the digital environment, Sarada Ranganathan Endowment for Library Science, Bangalore, p.1-17. Mokyr, J. (2002) The Gifts of Athena - Historical origins of the knowledge economy, Princeton University Press, Princeton and Oxford, p5. A. Umarani, “Knowledge classification – A permanent structure for dynamic knowledge, In: Cognitive paradigms in knowledge organization,” Proceedings of the second international ISKO conference Madras 26-28, August 1992, Sarada Ranganathan Endowment for Library Science, Bangalore, p. 211. J. Millis, “Introductory address, In: Knowledge organisation for information retrieval, proceedings of the sixth international study conference on classification research,” University College London, 16-18 June 1997, The Hague, Netherlands, FID, 1997, p.1. § Marc D. Hauser, an American professor of psychology, evolutionary biology, and biological anthropology, who has written widely on human and animal cognition, summarizes the distinguishing characteristics of human thought under four broad capacities. These include: the ability to combine and recombine different types of knowledge and information in order to gain new understanding; the ability to apply the solution for one problem to a new and different situation; the ability to create and easily understand symbolic representation of computation and sensory input; and the ability to detach modes of thought from raw sensory and perceptual input. ¶ This section of the paper is an improvised version to the original version presented by the author in a national seminar on classification in the digital environment in 2001, organized by Sarada Ranganathan Endowment for Library science, Bangalore, India.